Natural Stone sealers are the final finish to any travertine or marble project. 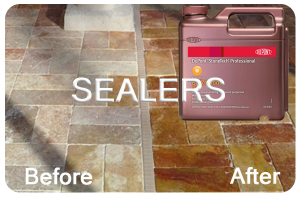 Sealers not only bring out the natural beauty of the stone but protect it from discoloration from spills. Travertine and marble are a naturally porous material and if you spill purple grape juice on an untreated stone it’s going to stain it. That is why you need to seal it. At Travertine Warehouse we carry DuPont products that are simply the best in the industry. Don’t skimp on the final step. It is just as important as all the others so make sure you get the best available. 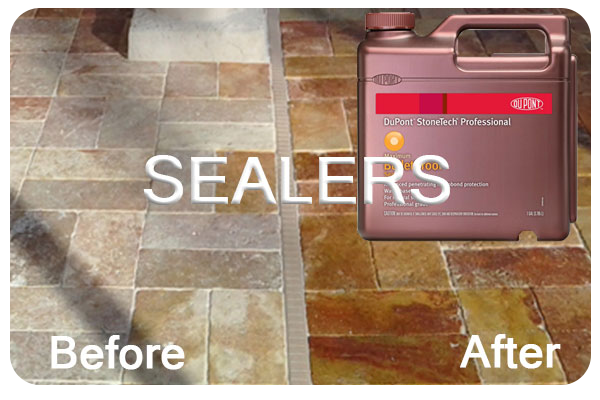 It will last longer and protect your stone better than any other sealer. You can trust us at Travertine Warehouse because natural stone is all we do.